My dog Sasha is almost 12 years old, which for her breed, a Pyrenees cross (crossed with husky) is at the end of the supposed “age span” which is 10-12 years. The first problem I noticed with her was the stairs. But with some help (senior dog harness) she can do most stairs on her own. But one of the things she always loved to do was to go out for a car ride. She loved to sit in the back seat as we took a drive out to the countryside or the parks. She used to bound in and out of the car, but this has become very difficult for her to manage and at 65 pounds, she is too heavy for me to lift into the car. You sometimes forget that they are getting older, and it may start with them not quite making it into the car, then eventually to them simply whimpering as they try to figure out how to get in. My hubby and I together can get her in the car, but I decided to do some research to see what older dog aids there are on the market to help our Sasha into her golden years without anxiety or pain. She has been a good dog to us, and I see no reason why she still can’t enjoy her favourite activities even if they are a bit slower than before. With some patience and some affordable aids, we can still do the things she loves and see her tail wag and that happy grin she does when she gets in the back seat. 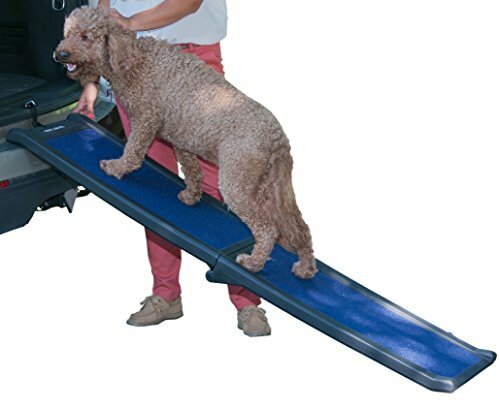 As I was researching I came across different styles of ramps that an older dog could use. I am sure you would have to guide them, depending on their agility, but I thought these were a really cool idea especially for the van or car. They can be folded down and stored in the trunk. It all depends on the weight of your dog and the angle that they can comfortable walk up into the vehicle. But I know my Sasha would find this easier. This particular one can handle up to 200 pounds, which would be perfect for those larger dogs, and it has a sturdy hinge and rubber feet to keep it in place. They can use these for getting in and out of the car or van. This way we could still take Sasha to parks further away. 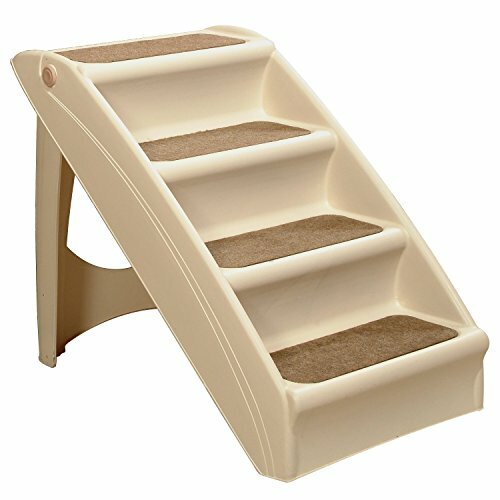 They can also be used in the house as in the picture for helping older larger pets onto the bed or any other higher surface. 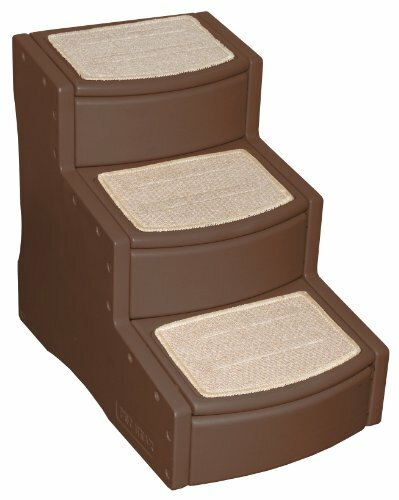 As I was researching ramps for my pet, I came across these stairs and thought they were a wonderful idea for the smaller pets, they don’t have to be old to use these as many couches and chairs must seem like a tall building to the tiny guys. But an older pooch might also find this an easier way to get to their favourite spots without trying to jump, would also be perfect if it is difficult for you to pick them up. This way they can come to you without hurting their little legs. If you like your pet sleeping with you on your bed, and it is very high, these would be a perfect way to get Fido up onto the bed. Many beds are very high now with the frame and the box spring and then the mattress, it can look like a mountain to an older pet. With just a couple of steps and up to 150 pounds, any pet could still climb on the bed with you to sleep. 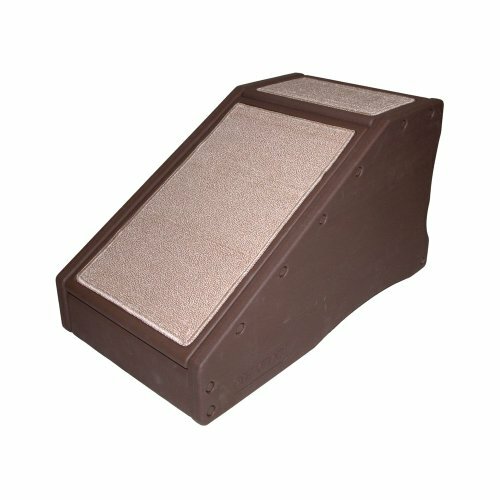 If your dog is not a fan of any kind of steps, and you are finding it harder and harder to pick up your senior pooch or cat, this little ramp is a perfect way for them to climb aboard and be with you. Most pets want to be with us, and if we are sitting watching our favourite program or even reading, it is nice to have your pet cuddle up to you. But sometimes it gets too hard for them to jump with senior joints, and it can get hard for us to keep picking them up, so this way they have the independence of hanging out with you on the couch and getting off the couch when they feel like it without fear. Senior dogs and even cats can have their very own set of problems; they do not all age the same way. But if you really observe them, you will notice what triggers the most anxiety. With my dog it is getting in and out of the car, or a long set of stairs that has her cringing. If you can spend a little to make life easier for them, then they are a happier pet. They have been there for us, we can be there for them in their golden years. My Sasha still wags her tail and grins like a puppy. Dog ramps are just the thing for older dogs, just like they are for people. Nice to see that there are options available. Its nice when your older dog can still go on road trips! What wonderful ideas. Our dog is fourteen this christmas and luckily he is only about 25 kgs but he is still heavy for me to lift into the 4x4 or up onto our bed. He used to be able to fly up on the bed and cannot understand why he can't now. These would be great for getting up on the bed although I bet I would trip over it during the middle of the night. At the moment he get up each morning between 3 and 4 am rolls on the lounge floor then yelps to us so we can lift him up onto the bed. We love him though. Best mate we ever had. Great helpful article for aging dogs. It is nice when they can still live a full life even in older age, and these aids really help. 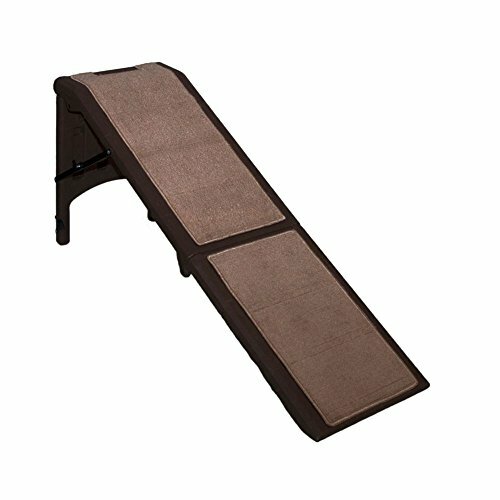 I can no longer lift my dog, so these types of ramps and stairs help me out too!